I found this one as well and wanted to share. Here is a Solo cup doll lamp or night light.This lamp is made with clear solo drinking cups, a craft doll, and clear christmas tree lights. 25 clear solo plastic drinking cups 9 oz size. short ones with the wide mouth (I believe they are punch cups) not the Milky looking ones but the clear ones. Pipe cleaners or plastic coated twist ties. Material-fabric 1 yard will do, lace, ribbons, etc. 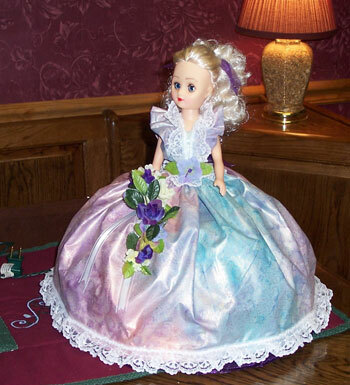 You will need to decorate your doll. A string of clear Christmas tree lights, 100 lights per string. A paper punch, a knife and scissors. You should be able to cut three or four pieces out of one pipe cleaner. The first row takes 12 cups. Poke a hole in bottom of cup, then cut a criss-cross where you poked your hole. This is where you will insert your lights later on. Do this to all 12 cups. Punch a hole in the side of the cups, at the top rim. Join your first cup to the second cup at the rim with a piece of pipe cleaner. Twist very tight then bend back into the cup. Punch a hole on the other side of second cup directly opposite of the other hole. (note) Do this around for the remaining cups . Hot glue the cups at the bottom rim as you go to help stabilize them. Set this row aside. Second row takes 9 cups do them the same as the first row, this row will sort of bend in, it ok that is what you want it to do. 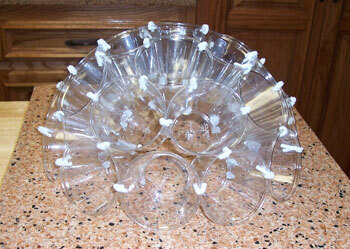 Set second row on top of first row of cups, where the cups meet punch a hole and secure with pipe cleaner. Then hot glue where the first row comes in contact with second row. Third row you will need 4 cups (note.) Now this is different. You need to secure each cup one at a time, until all cups are secured very tightly where it meets. This will draw each cup tight so it fits into the second row. Flip your ball over and hot glue each cup, at the top row. Take sting of lights, and start threading 4 lights per cup, starting at the top of the ball. If your string of lights has a connecter plug, you can plug in a small air fresher. Poke four lights per cup all around until you reach the bottom of the cups. Take the legs off the doll and hot glue the body piece at the hips in between the four top cups. 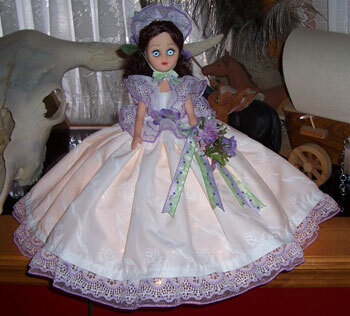 Now dress the doll as you wish, starting with the top part of the doll. Measurements of the skirt is 50 inches around. The measurement from the top part of the skirt too the bottom is 12 inches. Now decorate your lamp as you want. here is how the base looks.